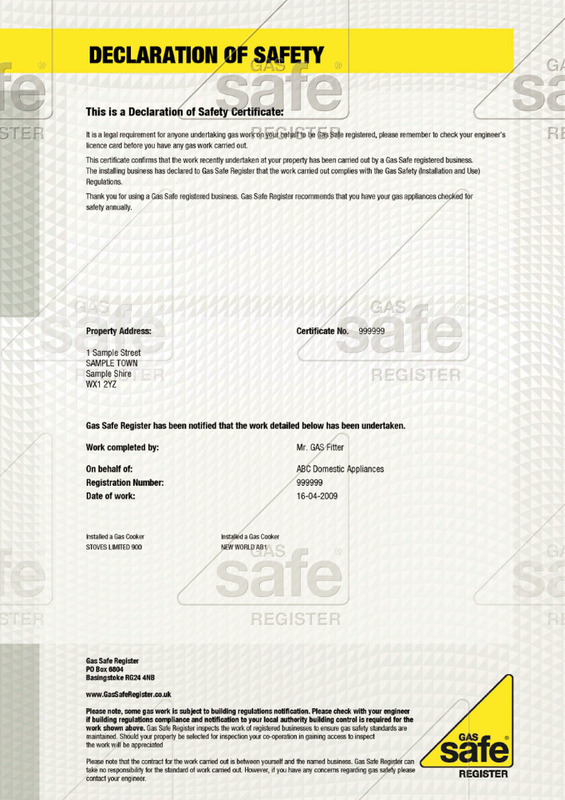 All gas installers/engineers must be registered on the Gas Safe Register The installation of any heat producing gas appliances (boilers, water heaters, warm air heaters, gas fires and flued cookers) in England and Wales requires the installer to tell Building Control within the proper Local Authority (LA) under Building Regulations within 30 working days. Once in receipt of this information, Building Control will then send the customer a Building Regulations Compliance Certificate or a Declaration of Safety Certificate. Either is a self declaration of compliance which belongs to the property and may be needed when the property is sold or mortgaged. New tenants should receive a copy of the safety report before they move in and existing tenants should get a copy of a new report within 28 days of the annual check being done. 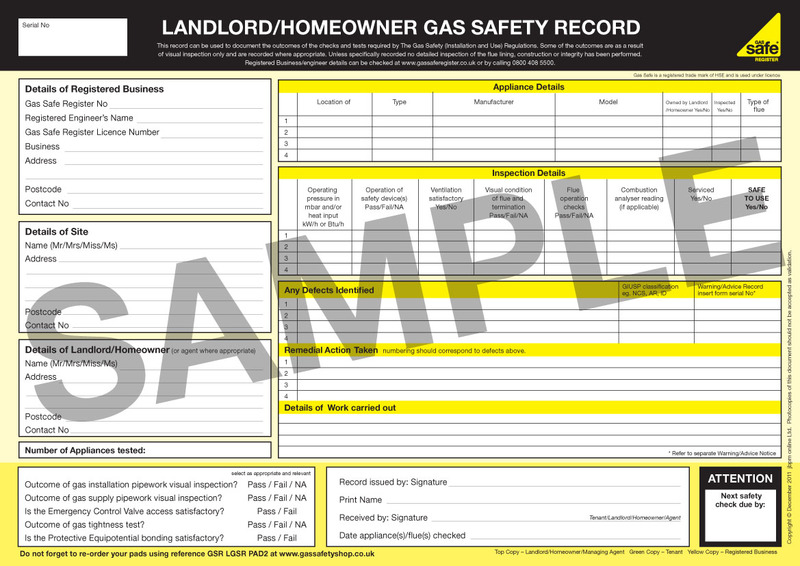 If tenants don’t have a current gas safety record they can report it to the Health & Safety Executive via form LGSR1. There must be no gaps between the expiry of the existing certificate (and the obtaining of a new one) with the landlord being required to keep a copy of each Gas Safety Record for at least 2 years. This record can be held electronically as long as it is a) capable of being reproduced in hard copy format when required (e.g. for the tenant/HSE/housing department) and secure from loss and interference and b) uniquely identifies the gas operative who carried out the safety check such as an electronic signature, a scanned signature, a payroll number unique to the operative, the name of the operative etc. A landlord, or gas engineer with the landlord’s agreement, may send or give a copy of the electronic record directly to tenants, provided they are happy with this arrangement and have the ability to get access to it. If letting agents are used they are also liable under the regulations to make sure that the Gas Safety Record is in place and all pipework, appliances, flues, gas central heating boilers, gas cookers and any gas fires are maintained in a safe condition. A statement confirming that the safety check completed complies with the requirements of the Gas Safety (Installation and Use) Regulations 1998. 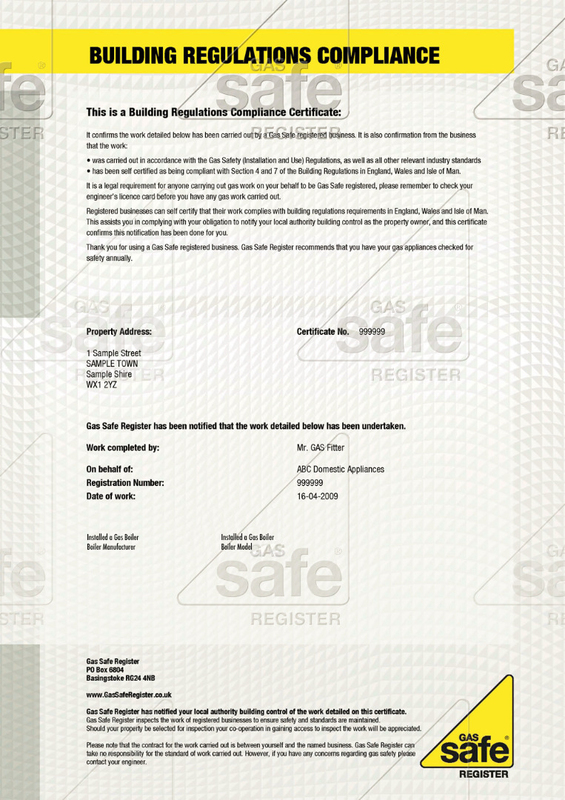 A sample of a gas safe record can be seen here. Any gas appliance which is brought in by the tenant means that they are responsible for arranging its maintenance by a Gas Safe registered engineer. The landlord does however still have responsibilities for parts of the installation and pipework. It is important that tenants tell the landlord well in advance if they are considering arranging for gas appliances to be installed/ replaced. Tenants also need to check at the start of the tenancy whether there are any flues or chimneys that are unsuitable for the installation of a gas appliance. Shut off the gas supply at the meter control valve (if it is known where it is).